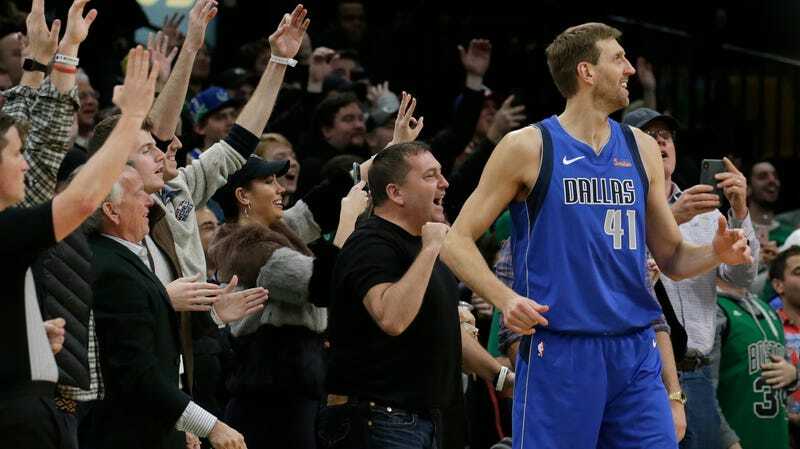 “Most career points in the arena by a visiting Western Conference player” is the type of mark that’s closer to a tough trivia answer than a cherished record, and Dirk Nowitzki only needed a single field goal to pass Kobe Bryant for it in Boston last night. Everyone involved wanted the vile Kobe to lose the record, and as Nowitzki kept clanking jumpers late in the Mavericks’ 114-93 loss to the Celtics, the situation became farcical. Jay King over at The Athletic has a roundup of postgame quotes from Celtics players after Nowitzki went 0 for 10, with half of those misses coming in the fourth quarter and four of them coming in the last 2:23. They range from sweet to amusing; personally, Jaylen Brown’s does a lot for me. “I wish (Nowitzki) would have hit one,” Hayward said. “I was sitting over there just like everyone else in the building saying, ‘Go in. Go in,’” Stevens said.